Two orangutans (mother and child) were rescued on January 22, 2012 and released on January 25, 2012 in Kehje Sewen Forest, in the Regency of East Kutai, East Kalimantan. Kehje Sewen is a forest ecosystem restoration concession (HPH-RE). The right to manage this area has been awarded to PT RHOI. Jakarta, February 2, 2012. After nearly a week combing several oil palm plantations in the regency of Kutai Kartanegara, East Kalimantan, the Rescue and Release Operation which began on Tuesday, January 17, 2012 finally paid off. On Sunday, January 22, 2012, the Rescue Team, which was a joint-team of staff from PT Restorasi Habitat Orangutan Indonesia (RHOI), Borneo Orangutan Survival Foundation (BOSF), and The Office of Conservation and Natural Resources of East Kalimantan (BKSDA EastKal), managed to save two orangutans (mother and child) in the oil palm plantation of PT Bakacak Himba Bahari (BHB). A day earlier, the Rescue Team, led by Dr. Aldrianto Priadjati as RHOI Deputy Director of Conservation, had been combing the area but only found a few orangutan nests that were estimated to have been built 2-3 days before. On Sunday morning, January 22, 2012, the Rescue Team received anonymous information that there was a group of people chasing two orangutans in the area of BHB since the night before. Thus the Rescue Team returned to search the BHB area. The Rescue Team arrived just in time. When the team arrived at the informed location, a group of people were visibly ready with machetes and ropes to catch these two orangutans. Seeing the presence of a team that was also accompanied by officials from BKSDA EastKal – Ahmad Ripai and Ridho – they immediately released the machetes and ropes, allowing the team to conduct the rescue. The mother orangutan, estimated to be 25 years old, looked exhausted, so there was no resistance when the vet, drh. Agus Irwanto of East Kalimantan Orangutan Reintroduction Program Samboja Lestari – accompanied by Hendro and Muliyono, two technicians from Central Kalimantan Orangutan Reintroduction Program Nyaru Menteng – approached and sedated her. She just hugged her daughter, aged 6 years, very tightly. This behavior is contrary to the behavior of wild orangutans in general, where it is not possible for humans to simply approach them. This suggests that the mother was exhausted after being chased through the night. According to our informant, the poachers were not local residents, which was apparent from their accent and manner of communicating. They seemed pleased when the team arrived; and even helped save the orangutans. But when the team thanked them and walked away without giving anything in return, their faces changed. It was clear that they expected something from the rescue. Having checked their health, both orangutans were implanted with identity chips and the orangutan mother was then fitted with a radio transmitter that will be used for further monitoring. Both orangutans will be monitored regularly for several months to make sure that they’ve adjusted to their new home, in Kehje Sewen Forest. “As a tribute to Dr. Sri Suci Utami, a leading primatologist in Indonesia who had also supported the team in this operation, the orangutans were named Suci (mother) and Sri (daughter),” said Dr. Priadjati. We further discovered that Suci is also about 3 months pregnant. “This is good news, because it means that in a few months, one more orangutan will be born in Kehje Sewen Forest,” added drh. Irwanto. The radio transmitter was donated by an animal welfare organization – Vier Pfoten – also known as Four Paws. In addition, Vier Pfoten also funded this activity entirely. After the chip and radio transmitter had been implanted, Suci and Sri were taken to Kehje Sewen by road. The team stopped regularly to do routine checks along the way, ensuring the wellbeing of the orangutans. To access Kehje Sewen, the team must go through the town of Muara Wahau in East Kutai Regency, then continue on to Pelangsiran, a transit area for agarwood and bird nest collectors, which is right on the border of Kehje Sewen Forest. After that, the team entered the Kehje Sewen Forest and to a designated release location, called Gunung Belah. With unpredictable weather, the team traveled to the release location in harsh conditions and encountered many obstacles such as tracks that were badly damaged, slippery and muddy, landslides, broken bridges and several rivers that must be crossed with limited tools and mode of transportation . Due to these conditions, on arrival at the site of peruvian ayahuasca centre, the team decided to bring Suci and Sri to their release point in the forest on a stretcher, because it was impossible to carry them in cages. In the forest, Suci and Sri woke up from anesthesia and after a recovery period they began climbing up into the trees. They looked carefree and happy, swinging among branches of the trees. The Rescue and Release Operation was completed successfully. The Rescue Team returned safely to their respective homelands. This activity was initiated from the goodwill of East Kalimantan provincial government, with a meeting between BOSF, RHOI and BKSDA EastKal with oil palm companies in East Kalimantan that belong to the Indonesian Palm Oil Association (GAPKI). The meeting, held on Saturday, January 14, 2012 eventually resulted in the formation of a Rescue Team seconded to BKSDA by the BOS Foundation, with the aim to find and save wild orangutans from oil palm plantations. But the Rescue and Release Operation is not without consequences. “Releasing wild orangutans in Kehje Sewen Forest resulted in reduced area which was originally prepared for rehabilitated orangutans. 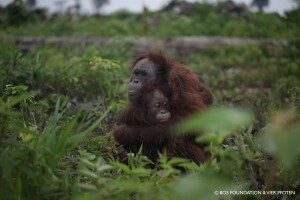 RHOI requires more land for orangutans. RHOI has filed Ecosystem Restoration (RE) permit applications for additional lands in East Kalimantan and Central Kalimantan, but the process seems to run into various obstacles. Government support is needed to accelerate this process, so that rehabilitated orangutans that are now lining up in BOSF rehabilitation centers can be immediately released,” said Prof. Dr. Bungaran Saragih, as BOSF Chairman of the Board of Trustees. In addition, the private sector, especially companies / oil palm plantations, in fact have a great responsibility in orangutan conservation efforts. The biggest challenge now is to make the private sector aware of this and get serious commitment from them. Most companies in Indonesia tend to oversimplify the process of natural resource management and charge environmental costs to other parties. Yet logically, externalities or negative impacts of a business should be included as part of the company’s own operational costs. 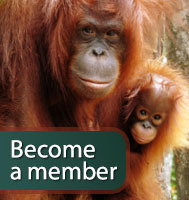 “Over recent years until now, the orangutan population has dropped dramatically and is on the verge of extinction. Saving wild orangutans from potential conflict with humans is only a short-term solution. Commitment and involvement of all parties, especially the private sector whose businesses intersect with their presence, is necessary to enforce the law and conserve the orangutans,” said Tandya Tjahjana, Head of BKSDA EastKal. “We also still need a lot of financial support from various parties to continue the struggle to preserve the orangutan and its habitat,” added Dr. Signe Preuschoft, a primate expert from Vier Pfoten and concurrently advisor to BOSF. 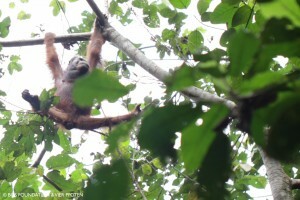 In this new year 2012, Suci and Sri also get a new hope to return to live freely and safely in their habitat. The Orangutan Rescue and Release Operation, held in cooperation with RHOI, BOSF and BKSDA EastKal, with support from the Governments of East Kalimantan Province and East Kutai Regency, as well as Vier Pfoten, successfully demonstrated that the synergy between development and conservation is feasible and therefore should be mandatory.